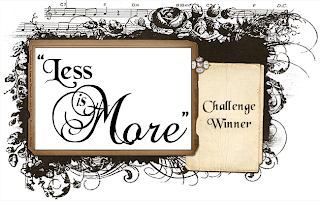 "Less is More" is publishing its 200th Challenge! ... from day one at Less is More and she's still as keen, kind and encouraging as ever. embossing powder and heat set. Another Jennifer McGuire tone on tone tip. 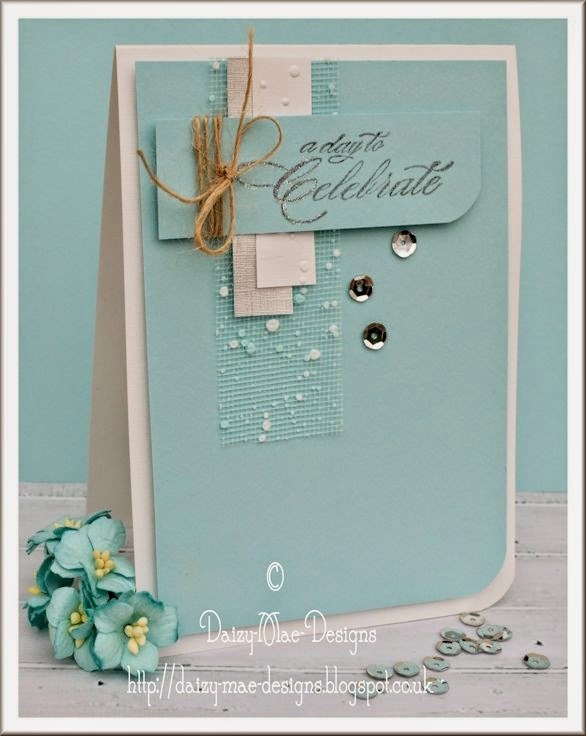 I layered some Pale Turquoise card over my White Linen base card. 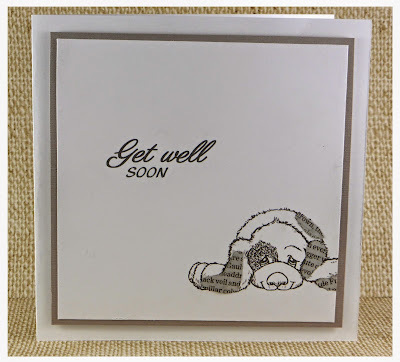 I then added a few strips of spotty net,white embossed card and silver paper. twine. I highlighted the first letter using my Glamour dust and quickie glue pen. A few silver sequins completed my card. More details are on Viv's blog... do visit her to leave a congratulatory comment! This is a CASE of a card from a LIMette challenge a couple of months or so back, but I'm ashamed to say I can't remember whose card so I can credit her, please let me know if you're reading this! Legs are from a Julie Nutting Prima stamp (the version I cased had a chap's legs in jeans), sentiment is by Magenta and the red Stickles came out again for the shoes. Here is a really simple card. Black card base, white embossing powder, a little colour added to the champagne with watercolour pencils and given a little shine with Glossy Accents. We managed to get half a dozen bottles of Champagne with a RRP of £25.99 each for £8 per bottle from Tesco... excellent value just in time for Christmas! It's probably what gave me the idea for this card. Do please visit your co-contributors to leave a friendly word... it is SO appreciated! As ever, the DT have additional cards on their personal blogs to give you further inspiration. They would ALL love to have you visit them and leave a comment too! We had the most fabulous response to our More Than One Tree, with some truly wonderful submissions and we could have showcased so many! These are Anne's favourites this week! Stunning tree scene, loads of white space, CAS perfection for me! Vibrant, opulent 'white space' and flawless stamping. Here is our ShowcCASe badge ladies... what wonderful work...and thank you! Be sure to join us for our special 200th Challenge tomorrow.... and we have a Guest Designer joining us, a very special LIMette! For this we would like to see some reference to any of these things.... bells, reindeer, Santa, elves, stockings, presents, decorations, Christmas songs/music/instruments... in fact anything Christmassy! for their tireless work in visiting and commenting on EVERY submission to our challenges. Not many challenges can boast that the DT comment on SO many entries. What very special people they are! True LIMettes! Thank you girls, you are absolute stars! then left to dry overnight. spritzing with water and Perfect Pearls. A DL card for a change. I found an image of Jingle Bells music using Google and cut a strip including the margin. 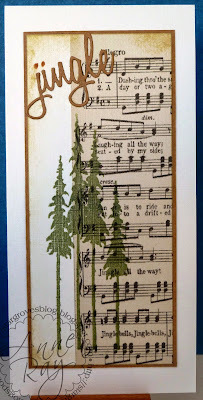 Added a bit of Old Paper Distress Ink, stamped Tim Holtz trees and added a Tim Holtz diecut word. I used a whole bunch of die-cuts for this card. The wreath (x2) is Memory Box, the holly - Impression Obsession, the sentiment from WPlus9 and the jingle bells from Memory Box. The mounts were cut with Spellbinder square dies. 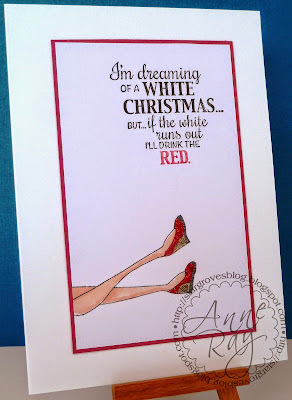 As ever I have a few more cards for you to see, I love to see you on my personal blog too! This is a week to have fun! If you don't have stamps for this week, there are various digi images which can be easily found! SO go on... enjoy yourselves! We saw some WONDERFUL work last week for our Starry Starry Night Challenge. As usual there were one or two submissions which missed the ONE LAYER stipulation but there was some terrific work. We're sure you'll agree that the ShowCASe this week is truly spectacular! Wonderful inking and perfect stamping! Superb combination of stamps and perfect placement. Just look at this jaw dropping scene! That sky is just wonderful! 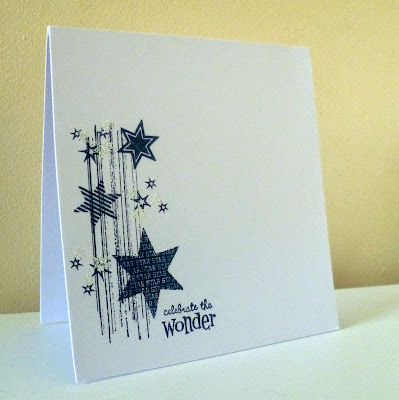 Another example of fabulous inking and stamping! Please take our ShowCASe badge with our grateful thanks! Another challenge will begin tomorrow at 8am, so do be sure to join us then! We thought we would continue with a theme this week which would allow you to continue increasing your stack of Christmas cards... if you choose to take a seasonal take on the challenge, although it's not necessary. That should give you plenty of scope! Remember to keep it clean and simple... a few cards seem to creep into our challenges which stray from our prime directive; one layer cards are ALWAYS welcome although not essential unless it's the second Saturday of the month! Here are our examples, although as ever we've all prepared extra cards for you to see on our personal blogs, so do be sure to try to check them out! 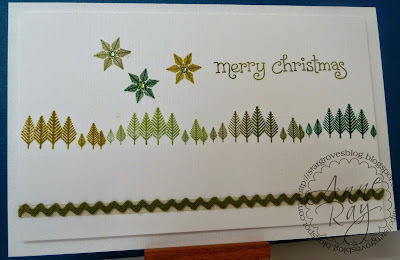 Perfect challenge for me, I love tree stamps! Waltzing Mouse Flurries trees and snowflakes with a Lawn Fawn sentiment, some gems and ric-rac. I imagine that some of you might have come to expect something a little like this from me with a topic like this. 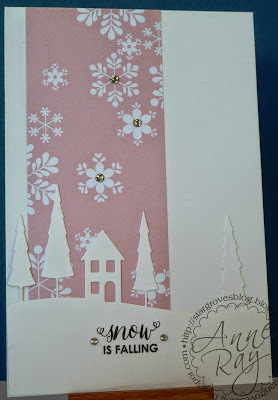 The stars (SU Gorgeous Grunge splats) were clear embossed and then the snow hills were inked with Distress inks using sponge daubers over a torn piece of Post it used as a mask. The stitched dies are from Lawn Fawn and the sentiment was computer generated in All things Pink font. to create a snowy forest scene. and to finish some gems to the trees from my stash. What an amazing number of fabulous entries we had for this Colour challenge, choosing was an absolute delight! 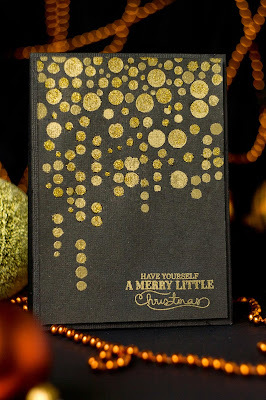 I adore this one so much I've even had to hunt down the embossing folder! It's amazingly simple yet so sophisticated especially with the black ribbon and gems. The silver version is fabulous too. I Googled it and discovered it was from Crafts Too! I hope that helps everyone. If you haven't visited the winners please do, we're sure they'd love to hear from you! Although gold - love it against the black for Christmas. Striking, simple yet so elegant. Love all the fun rainbow colours against the snowy backdrop. 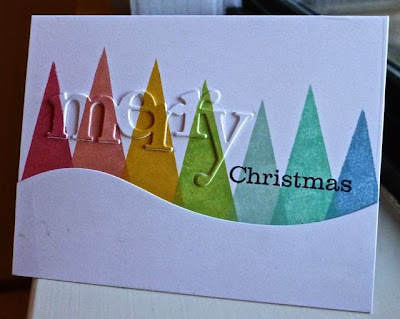 On top of that the stunning die-cut 'merry' inked to match. Please take our ShowCASe badge for your blogs ladies and everyone please come back tomorrow for a new challenge! Thank you all for fabulous entries last week! Sarah contributes to our challenges with stunning designs and is one of those super bloggers who visits and comments on fellow participants. We're sure that you will be delighted with our choice! If you let us know your contact details Sarah, we'll pass them on to Stephanie! Do look out for our ShowCASe tomorrow! One Layer Week - Starry, starry night! WOW what an amazing collection of Non-Traditionally coloured Christmas cards we had last week, our challenge really seemed to get your creative juices flowing! Please remember that white space and obviously we would like to see stars somewhere! Here are our contributions this week, although as usual you will find more examples on our personal blogs. Thank you to all those who visited us last week, we really appreciated your comments! and to finish a wrap around of navy and white twine. 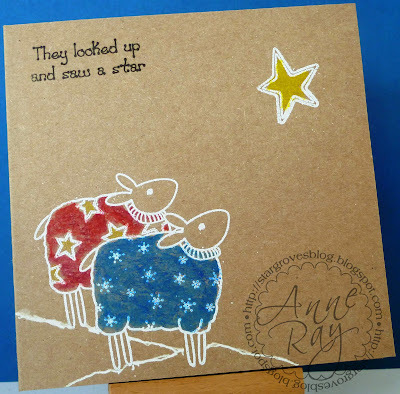 Love these sheep from Inkydoodles! White embossed with a groundline drawn in with a white pen, coloured with Inktense pencils. This is in a very like manner to Sarah's card... strange how we think on similar lines! Here the sky was repeatedly stamped and clear embossed using a tiny Lavinia stamp, through a Post It mask, cut with a circle die. The Post It circle itself was cut with an Impression Obsession skyline die. This mask was used to allow the sky to be daubed with Chipped Sapphire Distress ink. I used another die-cut of the same circle to draw the continuation of the circle at the base of the image with a fine Navy marker. The sentiment is from Hero Arts! We hope you'll have fun with this one as well as adding to your stocks of Christmas cards in readiness for the festive season. Some most interesting ways of using it appeared, demonstrating once again how creative our participants are! Here are our ShowCASe choices for this week! Look at this fabulous colour combination, beautiful composition too! Pauline called it romantic... it's certainly that! This is SO striking..What a wonderful use of the newsprint! What a clever idea to use newsprint as the shading on this cute little hound! Brilliant! Please take the ShowCASe badge ladies, with our thanks! This week's challenge has proved very popular... I'm sure you'll love next week's too, so pop back tomorrow and join us. A brand new month and a brand new sponsor... well an old friend really. We are delighted to welcome back Ribbon Girl as our sponsor this month! Mary has an amazing selection of ribbons, trimmings and embellishments, so if you haven't perused her shop before we're sure you'll be delighted with the products available. Do take a look! This week we have a COLOUR challenge for you to follow. You may use metallics and neutrals but please avoid any red or green. 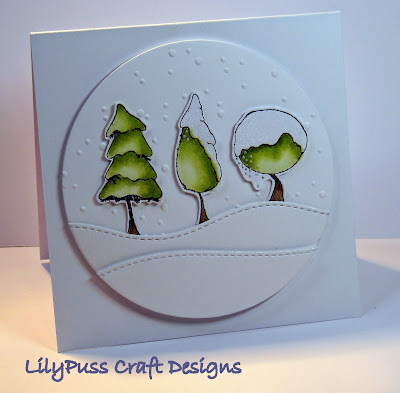 This tree stamp is a free Penny Black one from one of the craft magazines. I simply clear embossed it a couple of times and inked with Weathered wood distress ink, adding a few dabs of Stickles and some tiny gems. 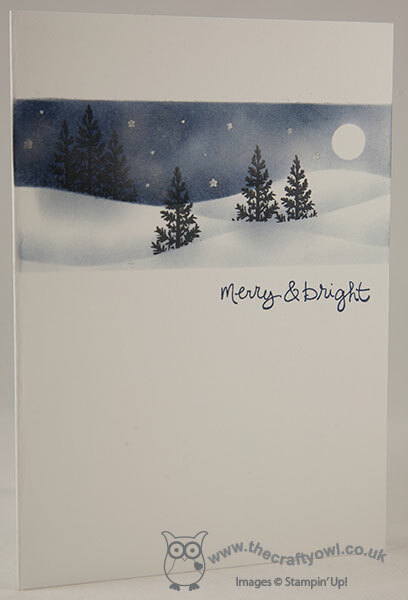 The Sizzix sentiment was also coloured with the distress ink to match the sky. There is a little clear Wink of Stella on the word, but it doesn't show up terribly well. Now I can't find the pen! 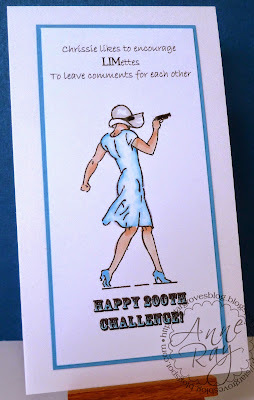 I have been going a little mad this week and there are heaps more cards for this challenge on my personal blog, I would be delighted if you could take a look! A bit button & bling-mad on this one! heart-shaped ornaments for this one with a pink & grey theme. which are heat-embossed with WOW sparkling silver EP. To finish some twine from my stash. 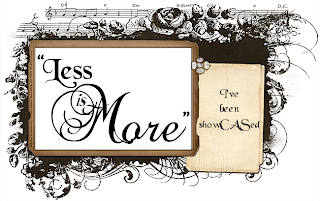 Pink Petticoat DP and sentiment, Memory Box die and some gems added. We hope you have fun with this one as well as cracking on with your production of cards in time to post for Christmas! Both Sarah and Anne also have other examples on their blogs too, so do pay them a visit! Anne and I will be going to the Craft Show at the NEC on Thursday this week. Sadly Sarah can't manage it this time but if any of you are going, do call and say Hi! If you do intend being there, email me and I'll let you have my mobile number so that we can find each other!